The pancreas is a small organ tucked in the back of your abdomen that helps break down your food and regulate your sugar levels. You don’t normally notice its presence, but when illness strikes, the results are devastating. Pancreatic cancer is typically found at a late stage and, as a result, is exceedingly difficult to treat surgically. Our inability to surgically remove pancreatic cancer in the vast majority of patients renders the disease incurable. It is also one we cannot effectively screen for, even though a predisposition might be lurking in your genes. We sat down with Summus-affiliated physician and Medical Advisory Board member John Chabot, who is the Executive Director of the Pancreas Center at the Columbia University Medical Center. 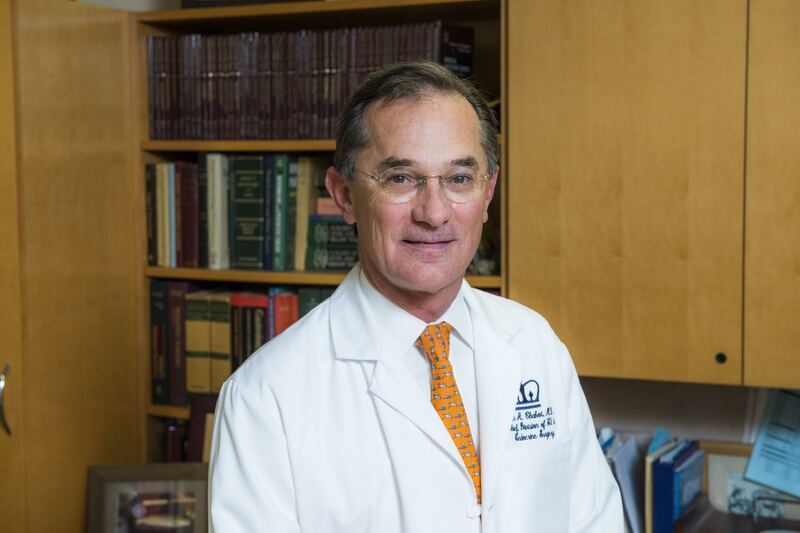 Dr. Chabot has been studying and treating pancreatic diseases his entire career at Columbia, where he performed the first robotic Whipple Procedure. We spoke to Dr. Chabot about his career treating pancreatic cancer and whether hope is on the horizon for an eventual cure. Jennifer Kherani: Why did you decide to dedicate your career to treating patients suffering from pancreatic cancer? John Chabot: I chose this field mainly because of the degree of challenge it has prevailed upon me. As a surgeon in training in the 1980s it was very daunting to get patients through these surgeries, and I wanted to undertake this challenge in order to help advance it. JK: Why is it so difficult to detect and treat pancreatic cancer? JC: One of the great difficulties with pancreatic cancer is the late-stage diagnosis that tends to occur. The disease is typically found after it has metastasized, or spread to other organs, and while chemotherapy is the current treatment for these patients, there is no expectation of cure. The pancreas is hidden from physical exams and symptoms don’t develop until late in tumor development. We also don’t currently have a screening technique. The only option would be an annual screening exam for every person, which is far too labor-intensive and expensive to make it a feasible option. JK: Are we any closer to developing an effective screening technique for pancreatic cancer? JC: There is genetic screening with MRI surveillance based upon genetics or family history of pancreatic cancer. At Columbia, there is a dedicated doctor who designs surveillance strategies for patients whose family tree points to a predilection for pancreatic cancer. We begin screening MRIs 10 years earlier than the youngest known family member with the disease and follow up with endoscopic ultrasound. This is not perfect given that many patients do not have or know of a family history with pancreatic cancer, but it’s a start. JK: What about a blood test to screen for the disease? CA 19-9 is a tumor marker used in treatment. Can that be used to find the disease? JC: We use this blood test and marker to track the disease once in treatment—for example, to ensure it drops after surgery has been performed and doesn’t rise precipitously following surgery, thereby portending a worse prognosis. However, it is a notoriously bad screening tool. It is not at all specific, meaning there are many false positive results. JK: Given the complexity of treating this disease, the late stage at which it is found, and the lack of surveillance tools available to find it in time, do you advocate using newer methods such as genetic testing for everyone, with targeted screenings for those with increased risk? JC: Currently we do not advocate genetic testing for all. It is very difficult to use this data in its current form. We are not yet at the level of sophistication in interpreting these test results for most people. However, at the rate we’re going, I’m hopeful we will be able to do so in a short period of time, perhaps within 5 years or so. I believe firmly that once big data is involved, and we have wide-scale systems and programs in place for detection as well as interpretation of the data, almost overnight it will be a valuable thing to do. There is hope in our midst. JK: What has been your greatest lesson learned during your career? JC: It takes a village. Treating pancreatic cancer requires an interdisciplinary team of not only surgeons, but oncologists, geneticists, nurses, counselors, and so on. With holes in the team, the treatment is incomplete and therefore lacks maximal efficacy. I have also learned to be aggressive and give up on no one. There is no patient for which treatment is too late. This is an aggressive disease. We must in turn be aggressive with our response and constantly push the envelope. We must never give up on a patient before we have begun to treat.